European government officials on Thursday 2nd December 2016 approved the nearly 440 million euros ($464 million) the European Space Agency (ESA) said it needs to complete the second phase of its ExoMars mission. “The Agency is encouraged to strive to reap the benefits expected from the significant investments made through the ExoMars programme, including those earmarked for the successful completion of the second ExoMars mission,” European officials said in a resolution adopted after a two-day summit in Lucerne, Switzerland. Of the additional 440 million euros approved for the ExoMars mission, roughly 100 million euros would be obtained from the ESA’s budget for mandatory activities. The ESA’s ambitious mission to Mars will consist of a rover and a surface platform, in addition to the Trace Gas Orbiter (TGO) — which is already locked in orbit around the red planet and would serve as a relay module for the 2020 mission. While the solar-powered rover will perambulate the rocky terrain of Mars, drill through the surface to collect samples, and look for signs of organic material and the possibility of life — extant or extinct — the surface platform will, over the course of one Earth year, investigate the environment at the landing site. “Nobody else is doing the science that is planned for ExoMars, drilling below the surface of the planet for the first time, below the soil that is irradiated, with a suite of instruments that is actually directly looking for signs of past or present life,” David Parker, ESA’s director of human spaceflight and robotic exploration, told the BBC. 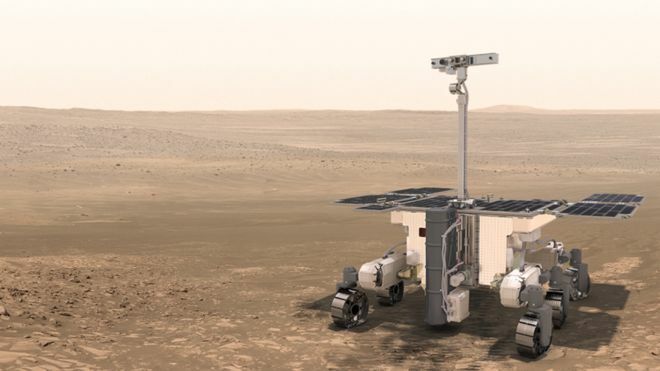 The rover is the second part in a two-step programme, which is being run jointly with the Russians to explore the possibility of life on the Red Planet. The first phase has seen the Trace Gas Orbiter (TGO) satellite arrive at Mars to investigate trace gases in the atmosphere that may be coming from microbes somewhere on the planet. The first part of ExoMars mission also included an entry, descent and landing technology demonstrator module, named Schiaparelli, which attempted on 19th October a soft landing on the surface of Mars but unfortunately encountered serious technical problems which eventually caused the lander to crash. After deep investigation, based on the large volume of data recovered from the Mars lander, ESA has concluded that a software glitch was the cause of the anomaly. As Schiaparelli descended under its parachute, its Radar Doppler Altimeter (RDA) functioned correctly and the measurements were included in the guidance, navigation and control system. The RDA employment on the 2020 mission lander is therefore to be expected. More details on the Radar Doppler Altimeter (RDA) can be found here.